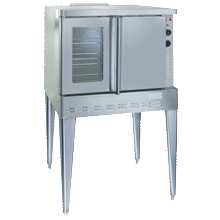 Imperial 6 eye Electric Range, with Oven Base. 17 KW total, 208 or 240 volts, single or 3 phase. 36" W x 36" H x 31.25" D. Ask for a shipping quote. Radiance Countertop Hot Plate, model TAHP-12-2. 2 burners, natural or LP gas. 12" wide x 30" deep x 10" tall, rated at 64,000 BTU's. 1 year mfg warranty. Ask for a shipping quote. 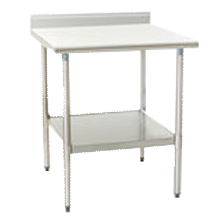 Radiance Countertop Hot Plate, model TAHP-24-4. 4 burners, natural or LP gas. 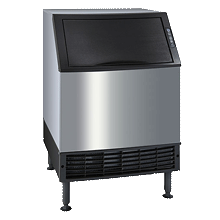 24" wide x 30" deep x 10" tall, rated at 128,000 BTU's. 1 year mfg warranty. Ask for a shipping quote. 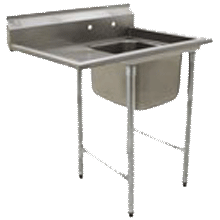 Radiance Countertop Hot Plate, model TAHP-36-6. 6 burners, natural or LP gas. 36" wide x 30" deep x 10" tall, rated at 192,000 BTU's. 1 year mfg warranty. Ask for a shipping quote. 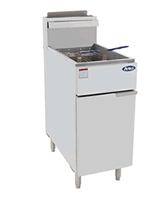 Radiance Countertop Hot Plate, model TAHP-48-8. 8 burners, natural or LP gas. 48" wide x 30" deep x 10" tall ,rated at 256,000 BTU's. 1 year mfg warranty. Ask for a shipping quote. Royal Range 10 Burner Range w/ 2 ovens, model RR-10 (RR-6-G24 pictured). 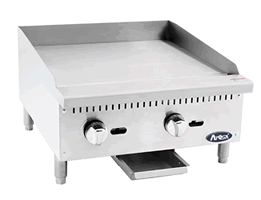 Features ten 12" x 12" open burners, rated at 30,000 BTU's each. Both ovens are rated at 35,000 BTU's. 60" wide, 31.5" deep. Pictured with optional casters (legs are standard). Specify natural or LP gas, 1 year mfg warranty. Ask for a shipping quote. Royal Range 4 Burner Range, w/ Oven, model RR-4. 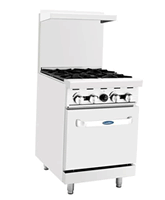 Features four 12" x 12" open burners rated at 30,000 BTU's each. The oven is rated at 27,000 BTU's. 24" wide, 31.5" deep. Pictured with optional casters (legs are standard). Available in natural or LP gas, 1 year mfg warranty. Ask for a shipping quote. Royal Range 6 Burner Range w/ Oven, model RR-6. 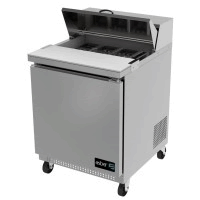 Features six 12" x 12" open burners rated at 30,000 BTU's each. The oven is rated at 35,000 BTU's. 36" wide, 31.5" deep. Pictured with optional casters (legs are standard). Specify natural or LP gas, 1 year mfg warranty. Ask for a shipping quote. Royal Range 6 Burner Range, with 24" griddle and 2 ovens, model RR-6-G24. 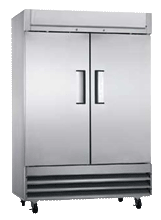 Features six 12" x 12" open burners rated at 30,000 BTUs, 24" griddle (left side standard) rated at 40,000 BTUs, and 2 ovens rated at 35,000 BTUs each. 60" wide, 31.5" deep. Pictured with optional casters (legs are standard). Specify natural or LP gas, 1 year mfg warranty. Ask for a shipping quote. Southbend model S24E, 4 burner range with standard oven. Natural gas (Lp available), 1 year parts & labor warranty. 6" legs included, casters optional. Contact us for a shipping quote.